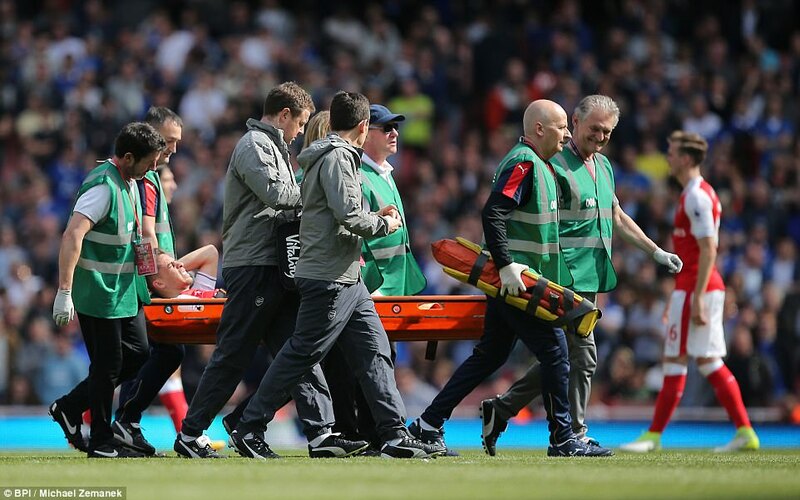 Arsene Wenger clung to the security of the tunnel and watched his players as they embarked on a trudge around the pitch to acknowledge supporters who were trying to digest the ignominy of Europa League football. The classic Wenger quote about caviar and sausage sprang to mind. 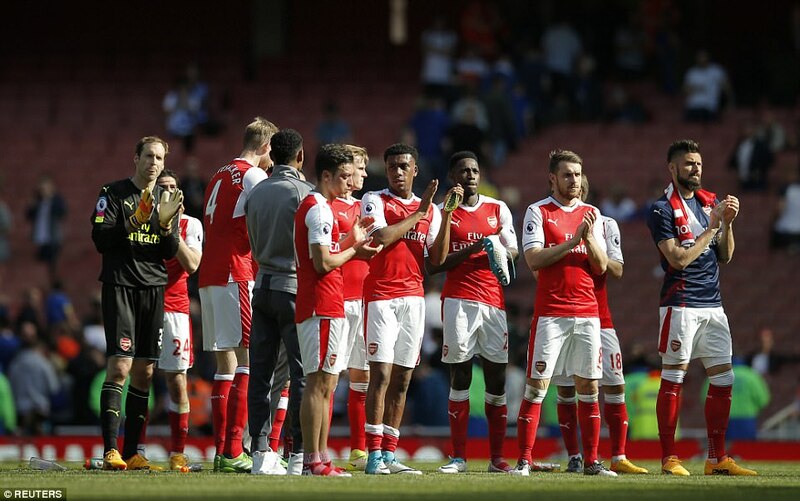 Having failed for the first time to lead them into the Champions League, the Arsenal boss opted not to join his team for a farewell wave and stayed on the periphery as fans united in protest against the American owner. 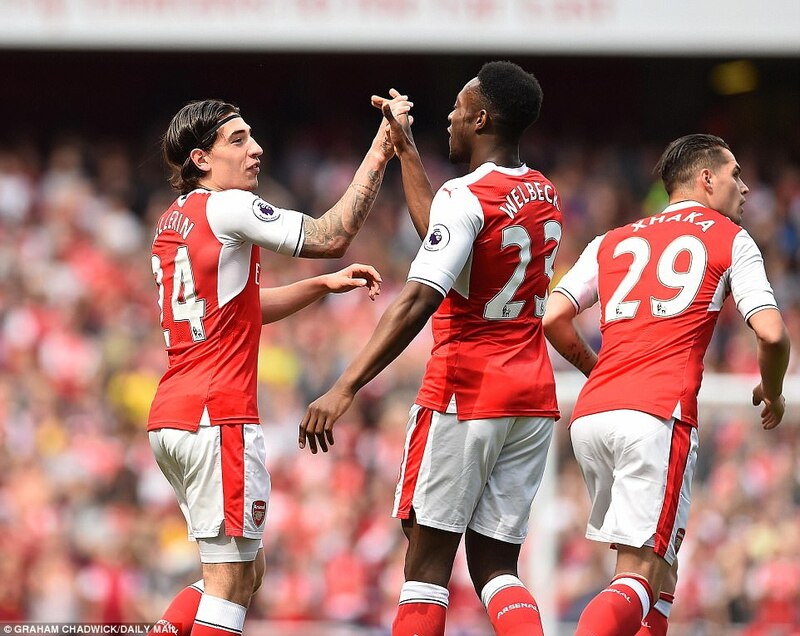 ARSENAL 3-4-3: Cech 7; Gabriel 6.5 (Mertesacker 53, 6), Koscielny 3, Holding 6; Bellerin 8, Ramsey 7, Xhaka 6.5 (Coquelin 62, 6), Monreal 6.5; Ozil 6.5, Welbeck 6, Sanchez 7.5 (Iwobi 67, 6). SUBS: Ospina, Elneny, Walcott, Giroud. 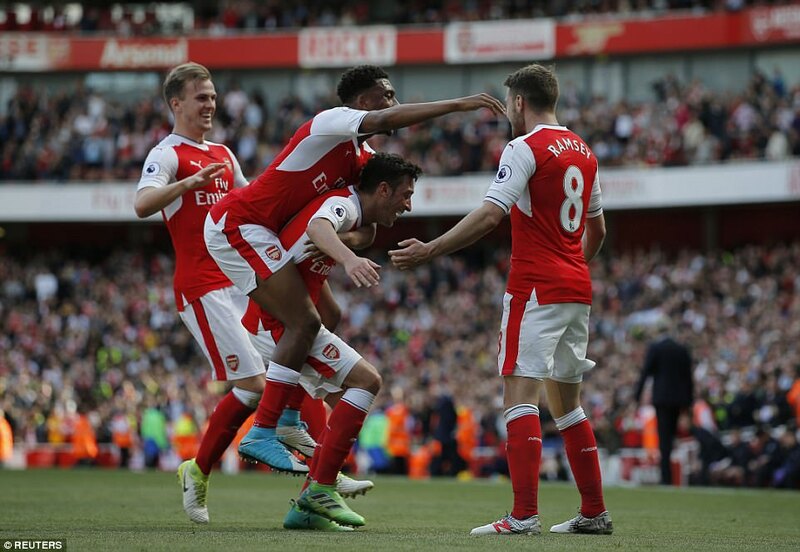 GOALS: Bellerin 8, Sanchez 29, Ramsey 90+1. 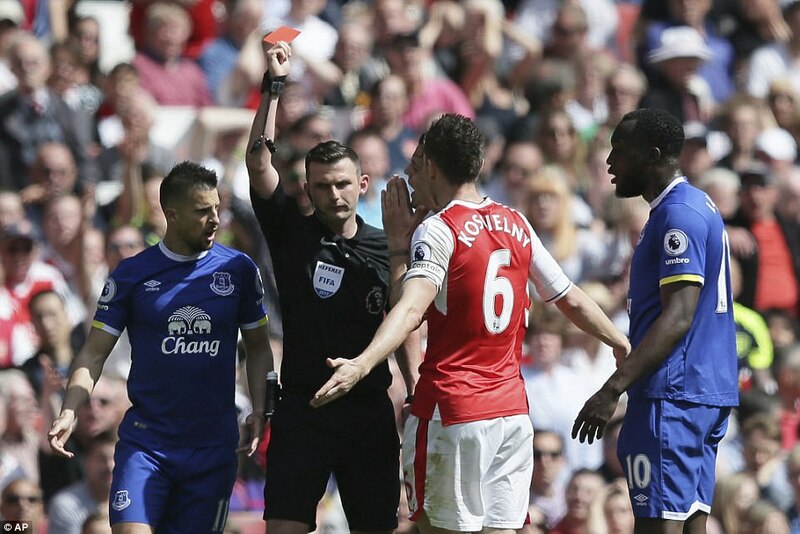 SENT OFF: Koscielny (14 min). EVERTON 4-3-3: Robles 6; Holgate 6, Jagielka 5.5, Williams 6, Baines 6.5; Gueye 6.5 (Barry 46, 5), Schneiderlin 6, Davies 6 (Barkley 21, 5); Valencia 7 (Kone 83), Lukaku 6, Mirallas 6. SUBS: Hewelt, Williams, Pennington, Besic, Kone. 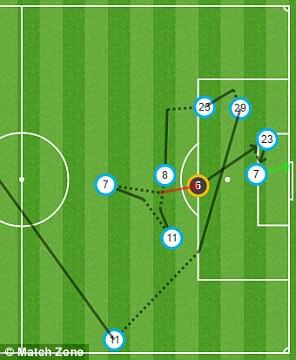 Alexis Sanchez finished off a fine move to give Arsenal a 2-0 lead. 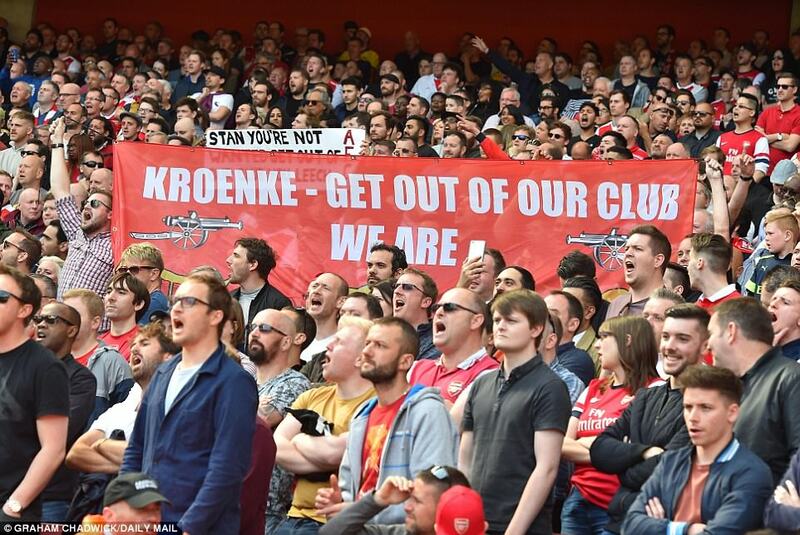 ‘Stan Kroenke get out of our club’ they sang with some gusto, as they did during the second-half of this breathless encounter with Everton, shifting the focus of the discontent from the manager. 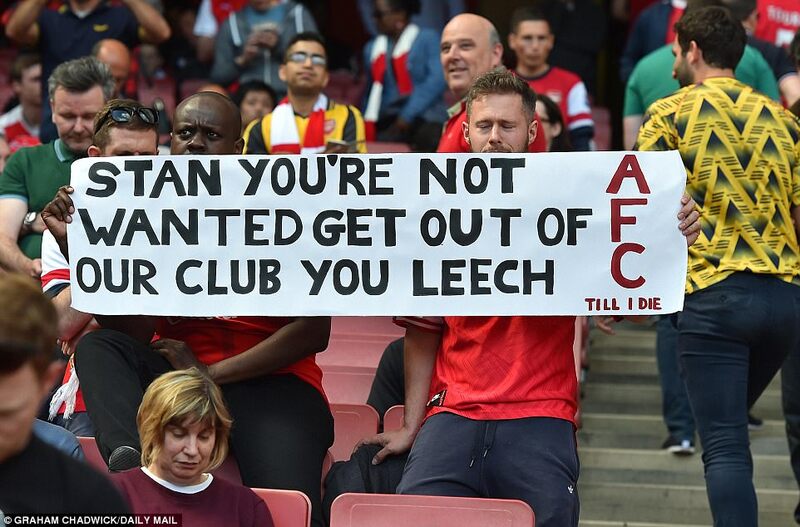 Kroenke is a populist target: remote and silent without Wenger’s history of success, and these cries were undoubtedly inspired by news of a £1billion takeover bid from Alisher Usmanov who owns 30 per cent of Arsenal. Wenger still splits opinion with so many eternally grateful for his early work: the training ground, the stadium, the culture, three Premier League titles, an unbeaten season, six FA Cups with another final to come on Saturday. And, his proudest achievement of all, an unblemished record of qualification for the Champions League. This badge of consistency has been ripped from his lapel because finishing fifth has always been his definition of failure. The last time Arsenal were left outside this elite club, Tony Adams, Ray Parlour and Ian Wright were in the team and Tony Blair was sweeping into Downing Street to a Britpop soundtrack. 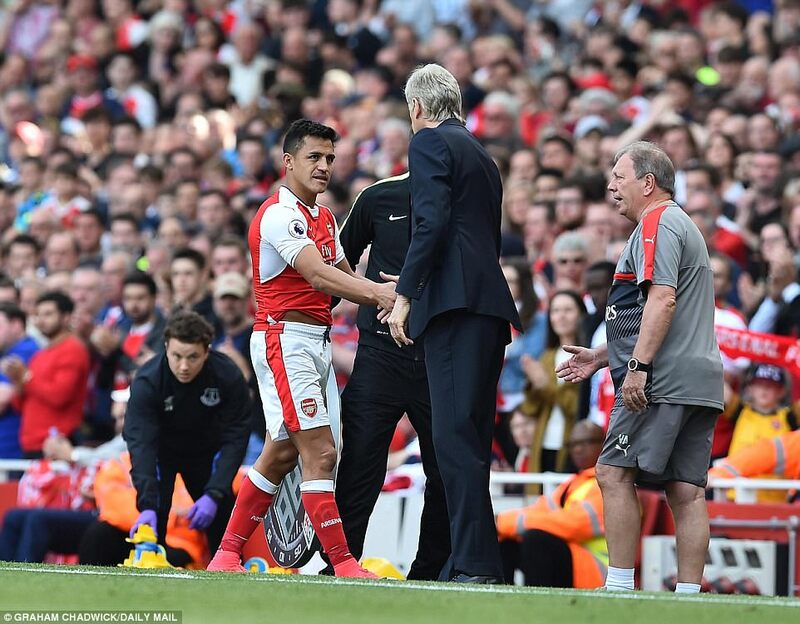 By the time his players returned from their lap of appreciation, Wenger had ducked down the tunnel. Off to fulfil his media duties, confirming his love and loyalty to Arsenal despite job offers from elsewhere while revealing the uncertainty of his own future had created a ‘horrendous’ environment for his team to perform in. For this, he lauded their spirit but, surely, Wenger could have cleared the confusion at any moment by declaring his intention to stay or leave. He could have cleared it there and then, in fact. Ahead of the FA Cup final. But he chose to keep it vague and uncertainty swirls away – even when all signals point towards a new contract for the 67-year-old manager. 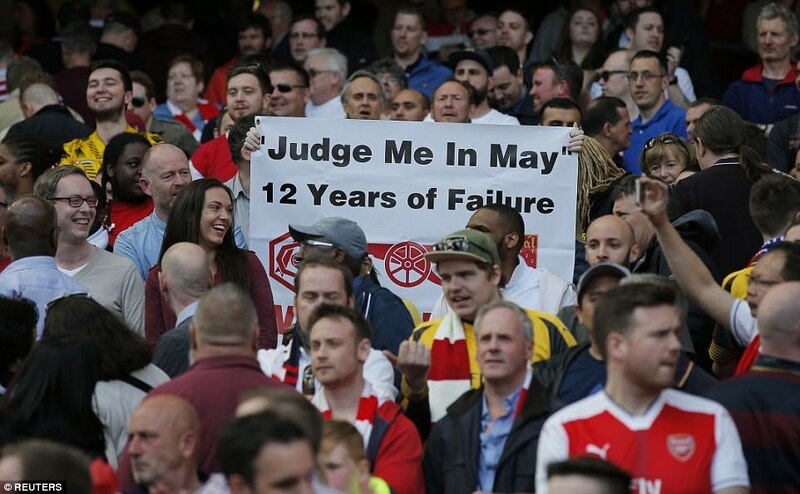 Arsenal have lost nine times in the Premier League. The damage was done weeks ago. 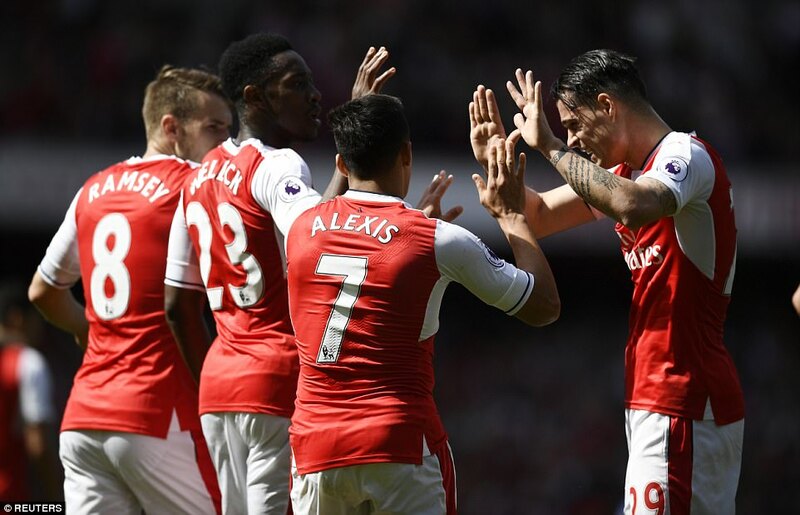 They accrued more points than last season when they finished second but the league is stronger this time and, ultimately, they missed out by two points – or one point and three goals. The search for where it went wrong can begin with defeat at home to Watford in January. It felt bad at the time and looks even more costly today. As do defeats at West Bromwich and Crystal Palace, and a goalless draw at home to Middlesbrough back in October. Had Boro taken a point at Liverpool there was a late opening for Wenger but Jurgen Klopp’s team were in control from early in the second-half. 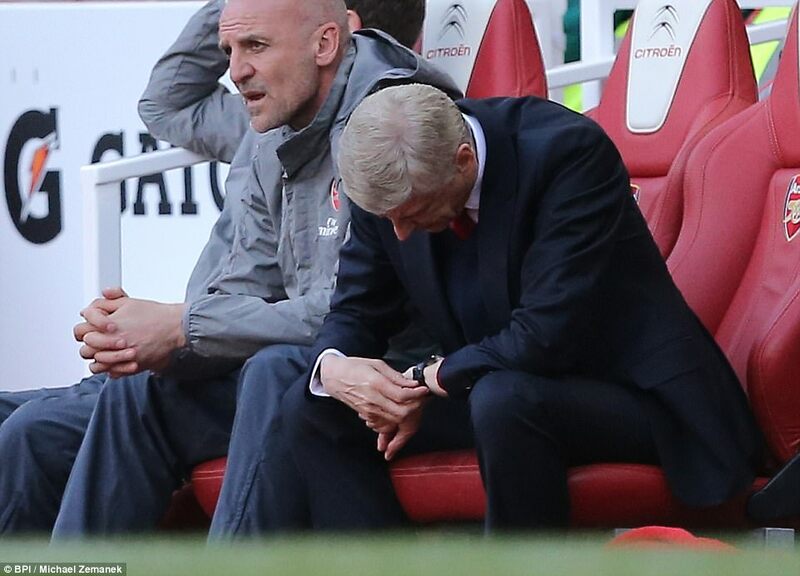 Wenger wore a look of resignation on the bench as the chill of Thursday night football blew into the Emirates. It all made for a surreal back-drop to a chaotic game. 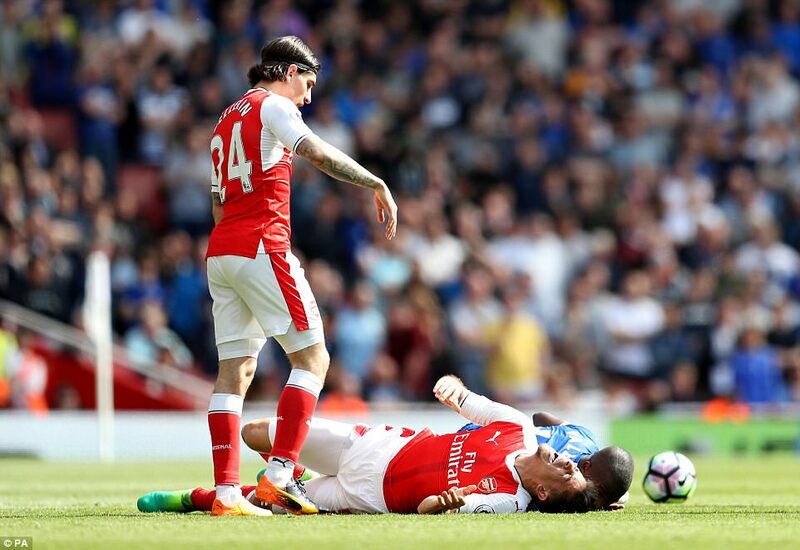 Hector Bellerin pounced to open the scoring and Alexis Sanchez made it 2-0 before half-time with his 24th goal of the Premier League season. 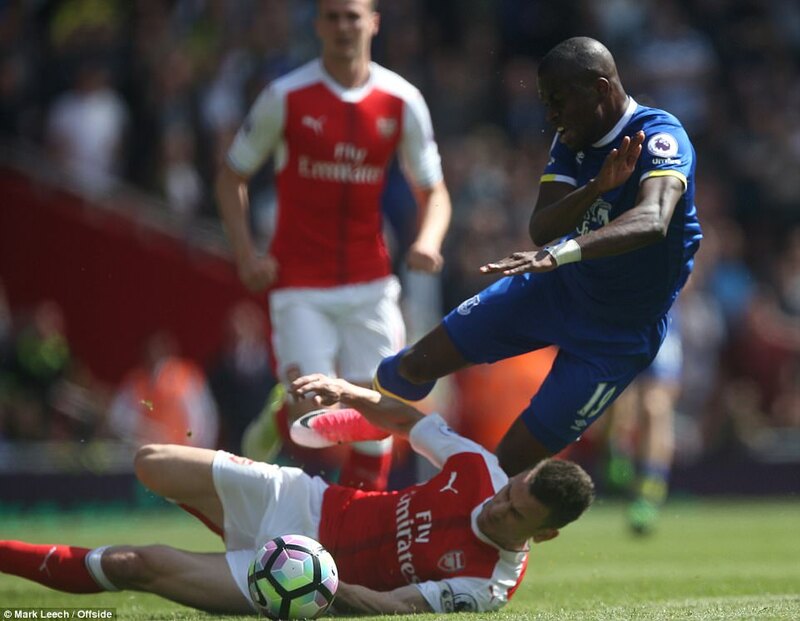 In between these goals, Laurent Koscielny was sent off for a needless flying tackle on Enner Valencia which left his team to play most of the game with 10 men. 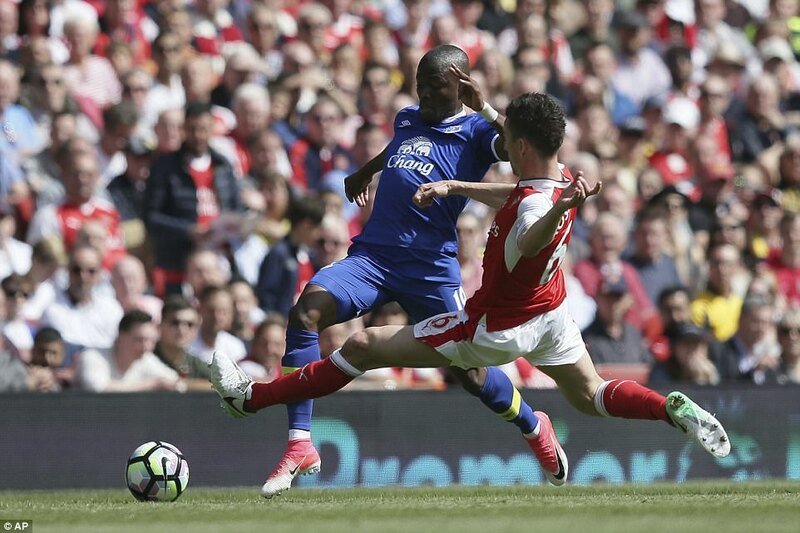 It also means Arsenal will be without their captain and best defender in the FA Cup final as they attempt to stop Chelsea winning the Double but it was hard to argue with referee Michael Oliver’s straight red. 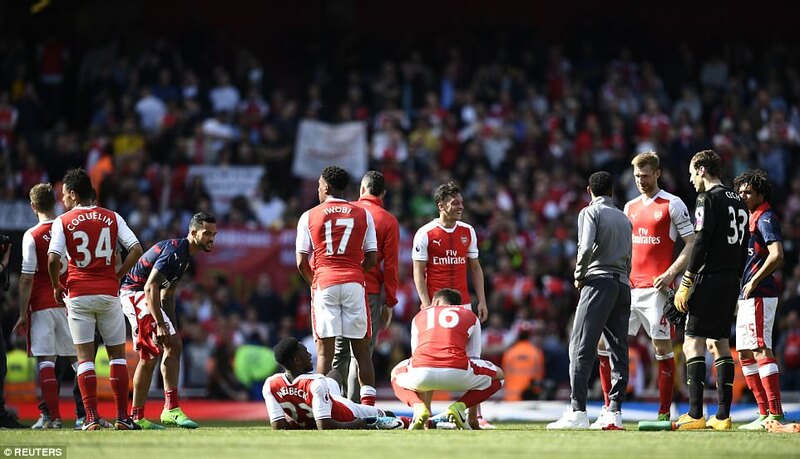 Petr Cech pulled on the armband and raised the question of who leads Arsenal out at Wembley. David Ospina has played in all the FA Cup games when fit but omitting Cech would mean the absence of another natural leader from a team with very few. 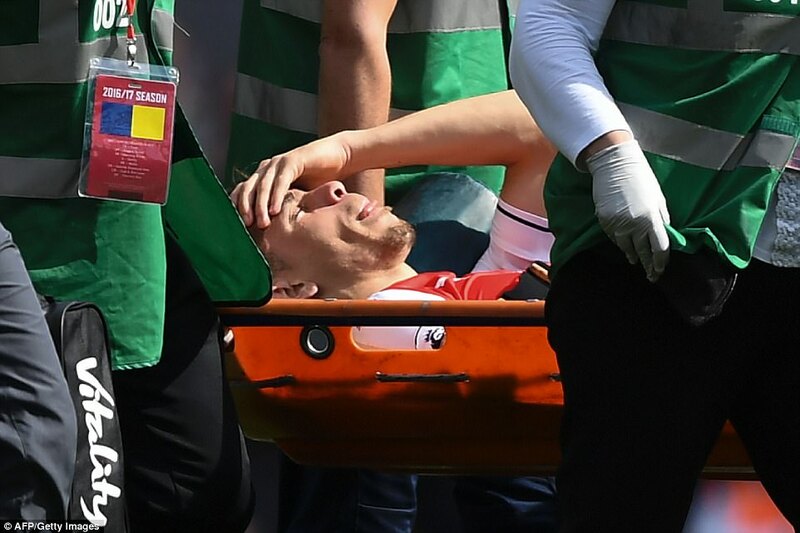 Wembley plans were hit further when Gabriel Paulista was carried off in the second-half after twisting his left knee beneath his own body-weight as he lunged into a challenge on Valencia. 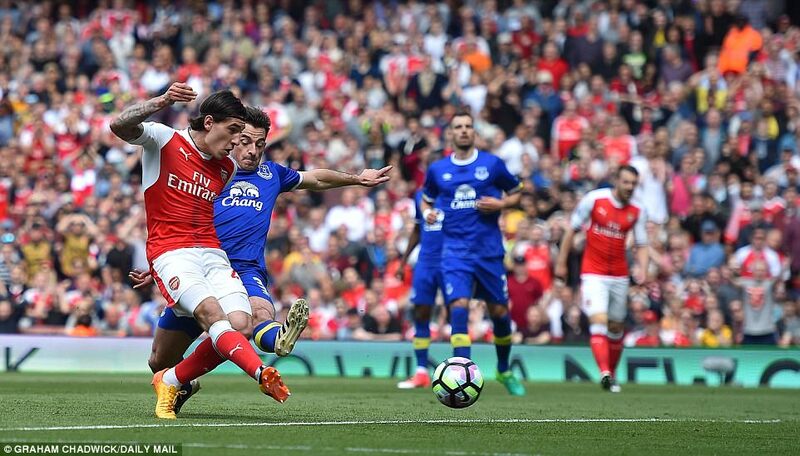 Gabriel was replaced by Per Mertesacker, making his first appearance since April last year. 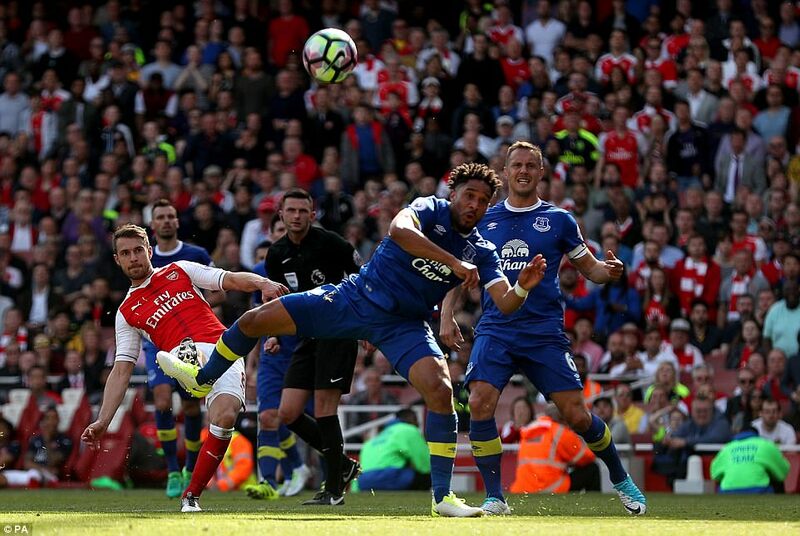 Everton, so wasteful in front of goal, reduced the deficit when Romelu Lukaku converted a penalty after Nacho Monreal had inexplicably handled a cross. 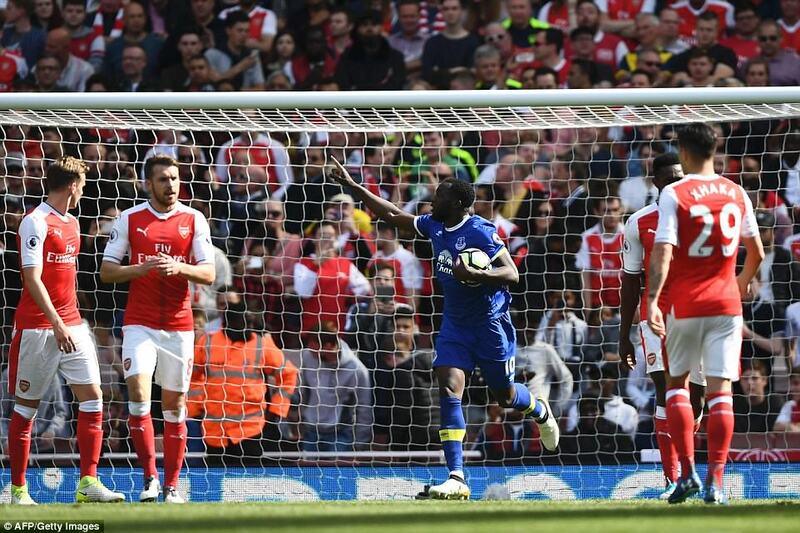 Lukaku finishes the season with Premier League 25 goals. Only Harry Kane has more. 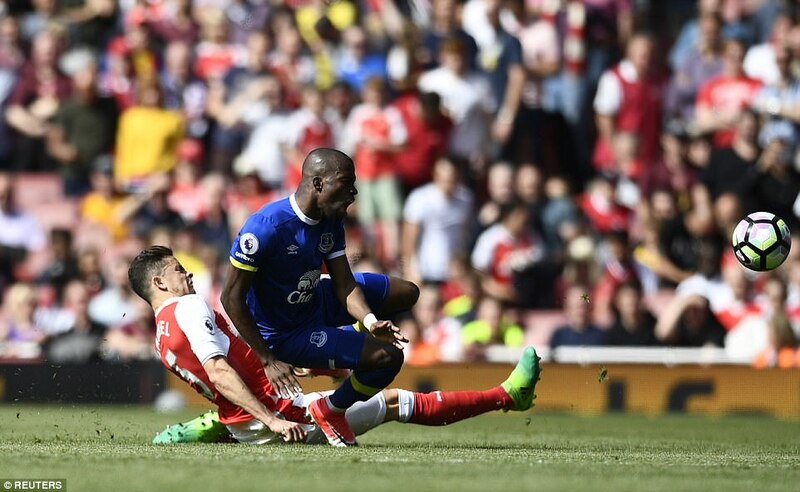 Everton finish marooned in seventh, eight points adrift of Manchester United in sixth and 15 ahead of Southampton in eighth. Ronald Koeman declared it ‘overall positive’. 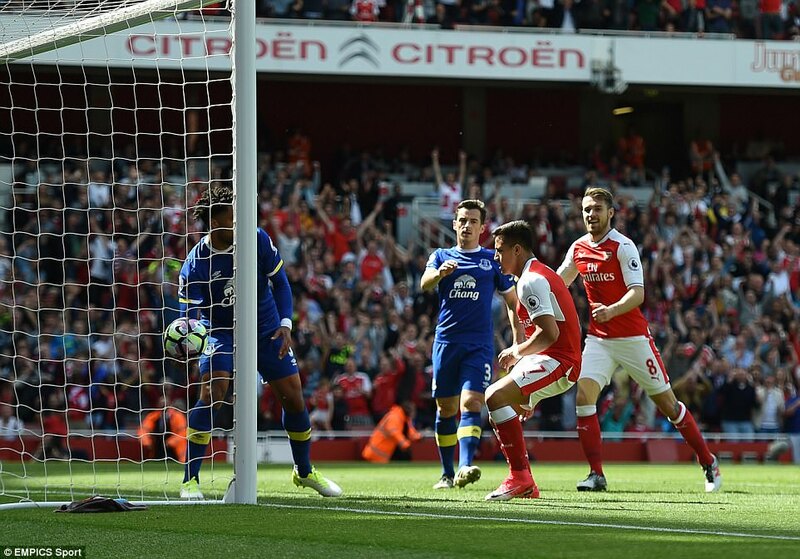 Aaron Ramsey completed the scoring with a beautiful third for Arsenal, curled into the top corner from the edge of the penalty area. 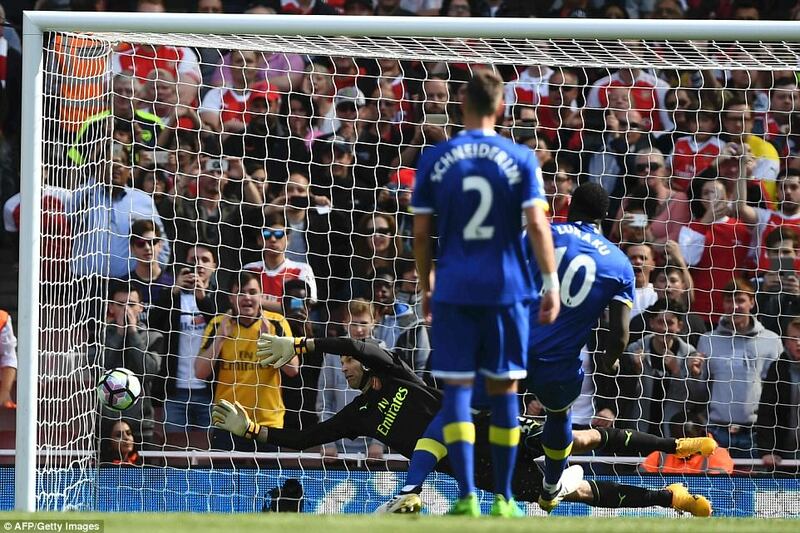 It seemed appropriate to bring to close the worst Premier League campaign of the Wenger era with such an attractive goal, and yet this time no-one was fooled.